If the holidays find you in charge of providing a nice meal for many unacquainted people, take a tip from the Janes family. In their restaurant, shown on this unused postcard from Shannon Hall, they managed to create cozy and private dining settings at long group tables in a crowded space. 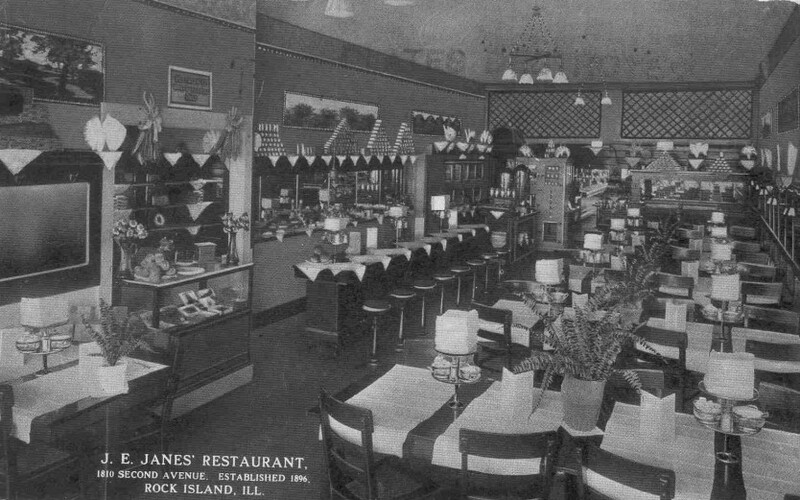 The postcard, which was published by the Fergason Post Card Company of Waterloo, Iowa, shows an interior view of the J. E. Janes’ Restaurant at 1810 Second Avenue, Rock Island and also notes that the restaurant was established in 1896. At that time, this was a three-story building, probably dating from the 1870s, that was divided on the street level to create two storefronts, 1810 and 1812 Second Avenue. Access to the upper stories, which were used for residential purposes was through a door and stairway between the storefronts. In the mid-1950s, the three story building was, replaced by a single-story structure, still with two storefronts, that remains today. Some years ago, the east storefront was faced with turquoise green and black structural glass, while that on the west, 1810, was covered with a similarly tinted metal tile. Both materials were used in the 1950s, but whether they were original is unknown. Today, 1810 has a newer brick facing, while the adjacent structure still has its historic glass front, mostly covered with a huge awning. And what about J. E. Janes? He’s first listed in city directories at the turn of the 20th Century, so he’s not the person who established the 1896 restaurant here. In 1900, the Argus noted that, “The ‘Julian’, the neatest and most up-to-date lunch room that Rock Island has had in recent years has been fitted up by John E. Janes under the bank building.” Which bank building was not specified. By 1902, Nick Coin operated a restaurant at 1810 Second Avenue, while John Janes lived upstairs. At that time, Janes was the proprietor of the Delmonico Restaurant at 1807 Second Avenue. The site is now a parking lot. In 1915, J. Elmer Janes, as he called himself, was still living above the restaurant and now was its proprietor. His wife, Blanche, worked as the cashier. Four years later, Janes sold his restaurant to John A. Bengston and left Rock Island. Bengston, who would become mayor of Rock Island in the 1930s, soon accused Janes of violating the “bulk sales law,” claiming that Janes had filed an affidavit stating, untruly, that the restaurant was debt-free at the time of the sale. Authorities were sent to Industry, Illinois, south of Macomb, where they arrested Janes on his nearby farm, and brought him back to the Rock Island jail. The outcome of the case is unknown. The postcard photo, dating from circa 1916, shows an elegant and well-decorated restaurant. From the tabletop ferns, to the many pictures on the wall, much thought went into the details. An unusual decoration along the tops of the back bar and room divider consists of pyramidal arrangements of what look like – but probably are not — canned goods. Typical of Rock Island’s downtown commercial spaces of the era, the restaurant is narrow and long. This somewhat awkward space is used very efficiently with a few large tables, most of which seat eight. Rather than a single large tablecloth, runners delineating pairs of seats break the tabletops into more intimate spaces. Relative privacy is further enhanced by large ferns and high pedestals holding condiments and a stack of thick linen napkins. For those in a hurry, eight counter stools are provided. Even here, the place settings use draped linens. A glass case holds candy below and what may be baked goods, along with two vases of sunflowers above. The Janes’ Restaurant may finally have proven unsuccessful, yet it appears quite appealing to our modern eyes. This article, by Diane Oestreich, is slightly modified from the original, which appeared in the Rock Island Argus and Moline Dispatch on December 5, 2004.